On the stage of the play "Romeo and Juliet", a transparent love begins. Seon-hwa (Roh Jeong-eui) who was helping her friend's audition in the department of theater, is spotted by Soo-yeon (Jo Soo-hyang), her senior from the department of theater and plays Juliet. Her co-star is Ha-nam ('Nara'), every girl's dream boy playing the role of Romeo. Seon-hwa gets attracted to Juliet while preparing for the play. 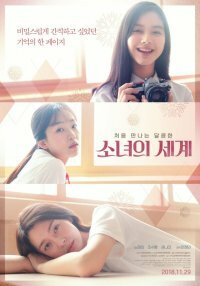 [Video] Peek Into the Diary and Heart of a Young Woman in Love in "Fantasy of the Girls"
[Photos + Video] New Stills and Trailer Added for the Upcoming Korean Movie "Fantasy of the Girls"
View all 35 pictures for "Fantasy of the Girls"